According to the owner she is in fantastic condition. Her bottom is freshly painted. Seats show no tears or serious fading. 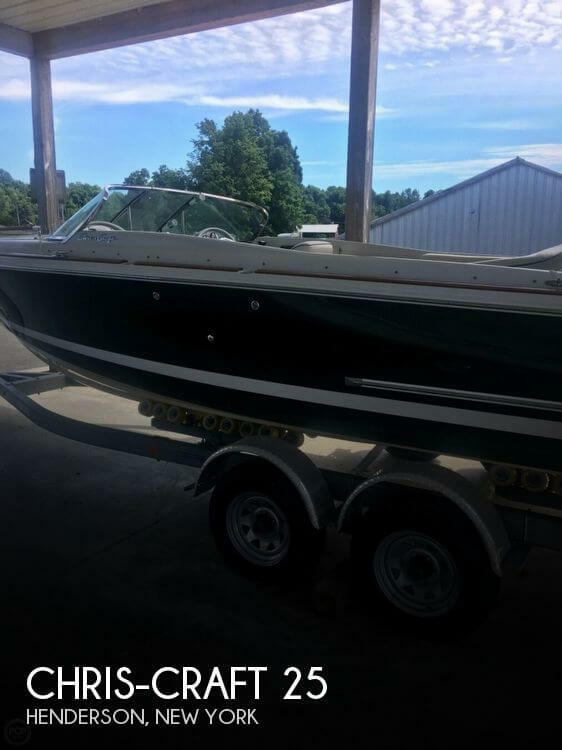 Bow Cover in Good Shape Clear Updated Eisenglass Hull has no major blemishes Stock #175510 Popular Well equipped versatile and quality construction 262 Sport Deck she has very low hours and has enclosure she's a real fun Sporty deck boat! 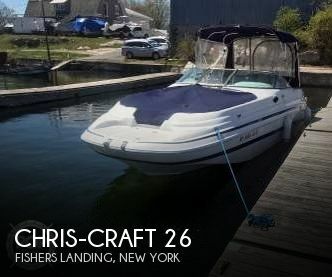 If you are in the market for a deck boat, look no further than this 2000 Chris-Craft 262 Sport Deck, priced right at $17,750 (offers encouraged). 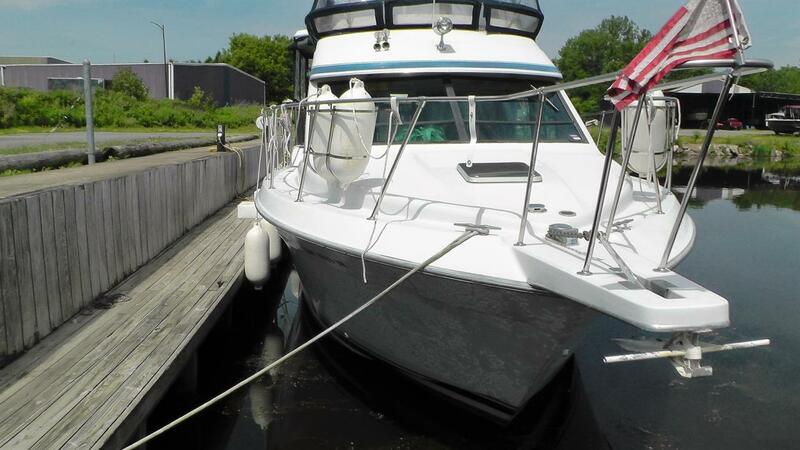 This boat is located in Fishers Landing, New York and is in great condition. She is also equipped with a Volvo Penta engine that has only 168 hours. Reason for selling is not using. Canvas In good shape, new in 2008 Access to main salon from the port side sliding door as well as from the steps down from the helm station. Wrap around settee in the cockpit area easily sits six. Both heads are electric. 4 year old Pro Mariner Battery Charger Isinglass in great shape and is tinted. 3 marine air a/c reverse heat systems. 420 gallon fuel tank gives you great extended range cruising. Stored indoor winters Stock #091547 Beautiful Chris-Craft! If you are in the market for an express cruiser, look no further than this 1988 Chris-Craft 381 Catalina, just reduced to $48,000 (offers encouraged). This vessel is located in Rochester, New York and is in great condition. She is also equipped with twin Crusader engines that have 692 hours. Reason for selling is wants to go larger. Twin GM 454's, radar, GPS, 2 VHF's, dual controls, Onan gen, bow thruster, full galley, sleeps 7, shower, two heads, 2 staterooms, dual AC/heat. Good overall condition. Only needs new canvas, and generator needs new exhaust manifold This boat is a great example of a classic Chris craft aft cabin and has been taken very well cared for by its current owner. 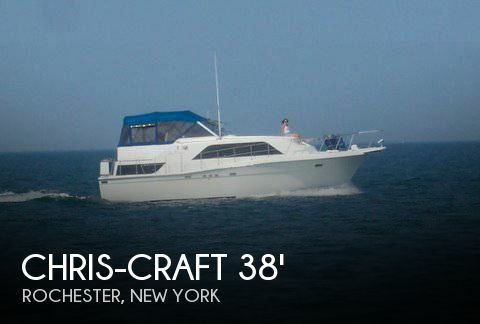 **Note** This Chris Craft is currently on the hard and is available for a complete showing visit top and bottom. 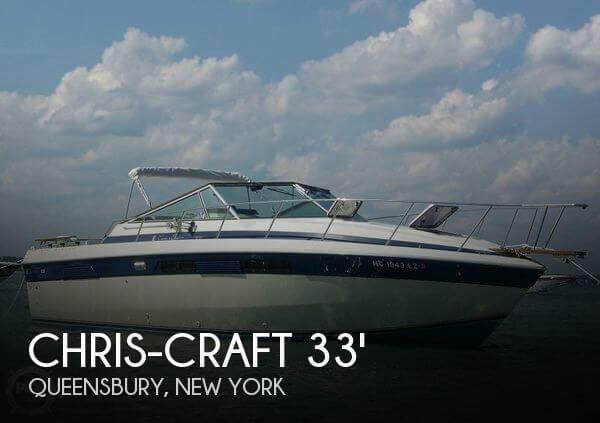 This is an excellent opportunity for someone who is seeking a real classic Chris Craft for use for many more years to come at a fraction of the price of a new boat. NOTE TO ALL POTENTIAL BUYERS !!! THE SELLER WANTS ALL REASONABLE OFFERS ON THIS VESSEL AS THEY WANT IT SOLD!!! Stock #114685 This CHRIS CRAFT CORINTHIAN is in Good condition! Great live aboard and cruiser! Ready to hit the water! 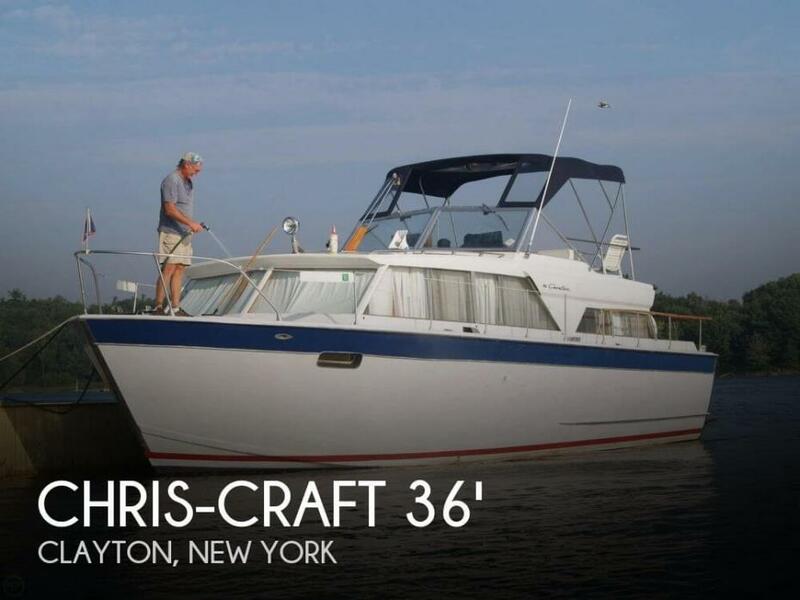 If you are in the market for a motoryacht, look no further than this 1979 Chris-Craft 380 Corinthian, just reduced to $23,900 (offers encouraged). 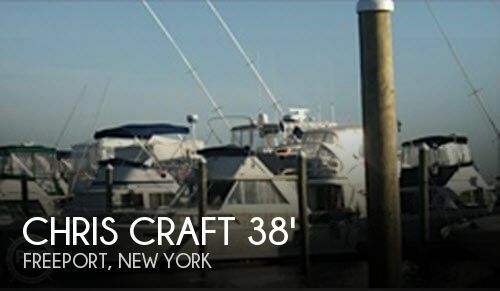 This vessel is located in Blue Point, New York and is in decent condition. The engine has 1,185 hours. As per owner, this boat has been well maintained and all 2018 maintenance has been performed. Boat is ready for the water. Great for fishing, and/or cruising around. Freshwater. Nice package with trailer! Stock #146446 Amerosport 25 Foot Day Cruiser powered by a 350 Chevy engine with 1600 hours! If you are in the market for an express cruiser, look no further than this 1987 Chris-Craft Amerosport 25 Day Cruiser, just reduced to $7,000 (offers encouraged). 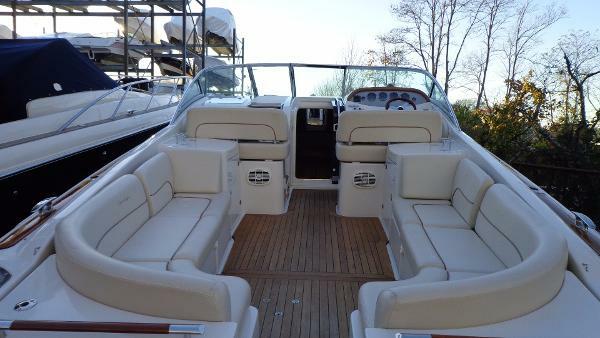 This boat is located in Lockport, New York and is in great condition. She is also equipped with a OMC engine that has 1,600 hours. 1984 Chris Craft Commander 332 stateroom in the bow with a door. Galley and Head on the starboard side. Dinette and Bed conversion on the port side. Condition and shape it is in: The only problem it has is fiberglass cracks on the top side by the antenna or horn area, which they say is normal on that boat at that age. Stock #096803 332 Commander with Separate Forward Bedroom with Door! 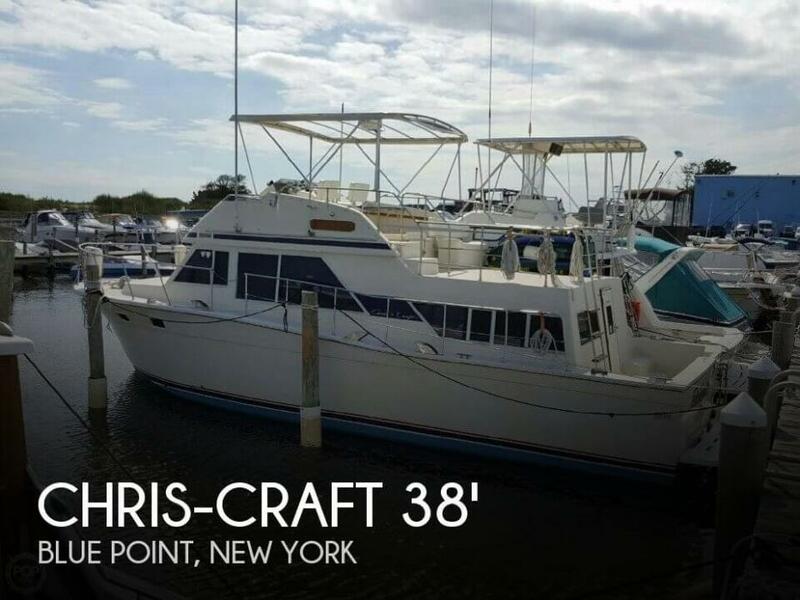 If you are in the market for an express cruiser, look no further than this 1984 Chris-Craft 332 Commander, just reduced to $17,500 (offers encouraged). This vessel is located in Queensbury, New York and is in great condition. She is also equipped with twin Crusader engines that have 650 hours. As per the owner, the boat is in very good condition inside & out. Well maintained, well kept, clean vessel. No trailer, but might have a slip. Engine hours unknown are unknown at the present. Looking for offers! 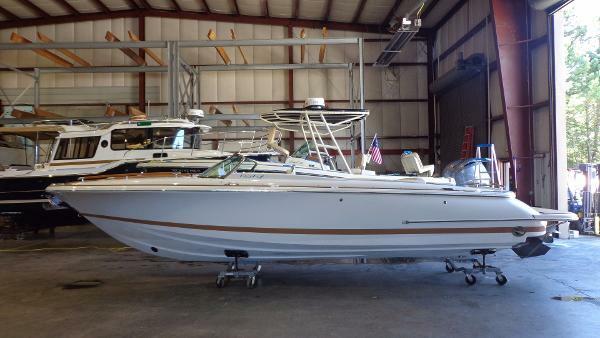 Stock #112712 Fully equipped, well maintained boat ready to day trips or weekend getaways! 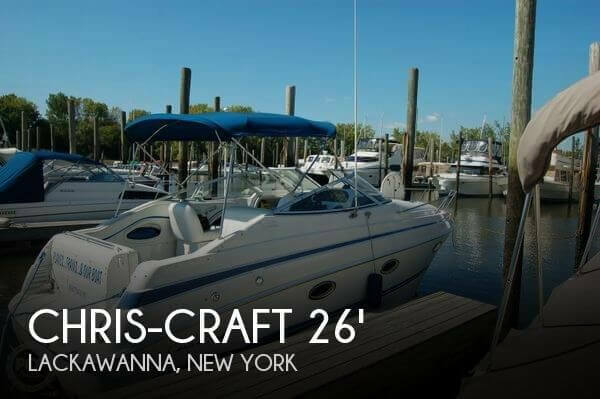 If you are in the market for an express cruiser, look no further than this 1997 Chris-Craft Crowne 26, priced right at $17,499 (offers encouraged). This boat is located in Lackawanna, New York and is in great condition. She is also equipped with a Volvo Penta engine. Per Seller: She is in nice shape and needs a little TLC and she will be ready to bring home the big fish again. Currently needs electronics head units as the transducers & radar dome are already in place to be hooked up. She is well powered with twin Mercruiser 7.4's pushing out 330 horsepower each. She also has new Transmissions when the engines were replaced. The engine room gives you plenty of room to get at every part of each engine as well as the generator and other equipment. Stock #116704 Very Low Hours !! GOOD condition. Seller is looking for offers !!! 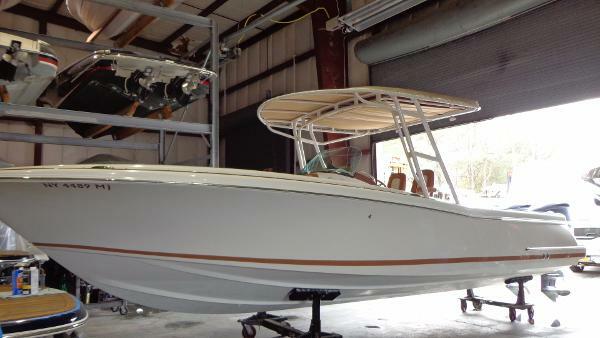 If you are in the market for a sportfish/convertible boat, look no further than this 1970 Chris-Craft 35 Commander, just reduced to $12,999 (offers encouraged). 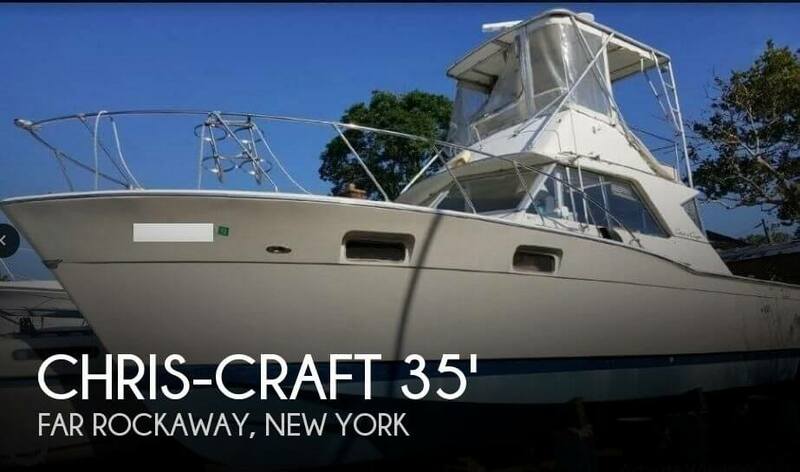 This vessel is located in Far Rockaway, New York and is in good condition. She is also equipped with twin Mercruiser engines that have only 200 hours. This Freshwater only beauty recently underwent extensive restoration in 2006 including The West System of the entire hull, a new mahogany transom, and oak forefoot. She also has Brazilian cherry wood on the aft deck and at the helm installed in 2007. A new Keel and the Sunbrella enclosure were installed in 2011. Per the seller: The engines run great, and she is very seaworthy. Update July 17th, 2017: The entire hull has been painted, including the boot stripe and the bottom. New Twin mahogany ladders have been added to the transom for ease of access. Stock #057071 This Gorgeous Chris Craft shows her pride of ownership. If you are in the market for an antique and classic boat, look no further than this 1967 Chris-Craft 36 Cavalier Motor Yacht, just reduced to $23,900 (offers encouraged). 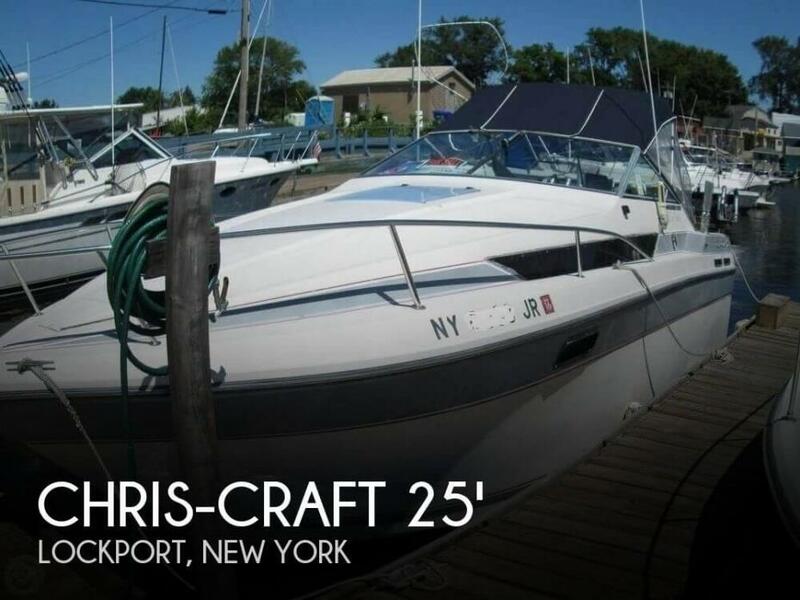 This vessel is located in Clayton, New York and is in great condition. She is also equipped with twin Chris-Craft engines that have 1,396 hours. 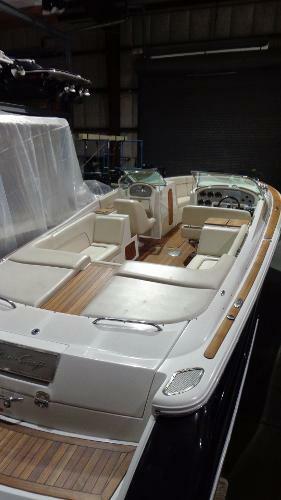 2013 Chris-Craft Corsair 25 This one owner, fully optioned 25 Corsair Heritage Edition has only 42 hours! Powered by a Mercruiser 8.2L 380HP Bravo III Fresh Water Cooled engine. Mercruiser warranties in place.This is as close to a brand new 25 Corsair as a used one will ever be and has always been stored inside!